The park has recently undergone a major upgrade and now many of our 75 pitches are hard standing. We have also built a childrens play area and BBQ area in the centre of the park. The bottom 6 acres have been turned in to a nature reserve with paths. For the 2018 season we have added 7 new hard standing pitches with drainage, and will be building a new toilet and shower block once we have all the relavant permissions in place. We have found maps showing the outline of the park as far back as 1872 and we believe believe it was used as a training camp for the Lovat scouts around 1900. At the edge of the park there is a WWII pill box which would have been used to defend the Lovat Bridge if there had been an invasion. The Lovat Scouts were formed during the Boer War and were the British army's first sniper unit. Many of the techniques they invented are still in use by forces globally. 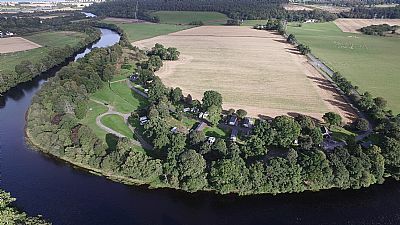 Beauly is right in the heart of the Scottish Highlands and is the ideal place to base your Highland adventure with many great places to visit within an hours drive on both the East and West coasts. If you are planning to do the famous North Coast 500 route then our holiday park is the ideal staging point.